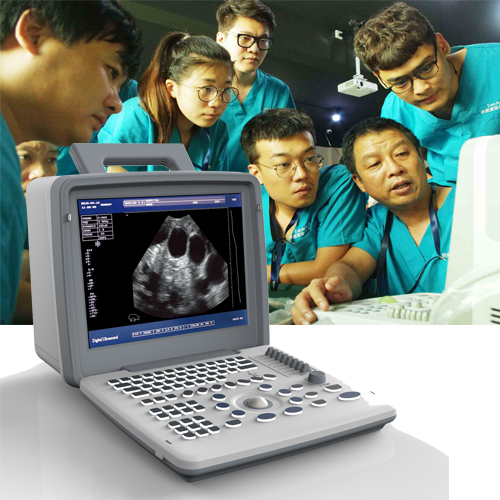 resolution linear/convex/micro convex ultrasound scanning diagnostic equipment. Focus position: dynamic electron focusing. Image processing: 8 γ corrections, frame correlation, point correlation, line correlation, digital filtering, digital edge enhancement and pseudo color processing, etc. Measuring function: Distance, circumference/area (method of ellipse, method of loci), volume, heart rate, gestational weeks (veterinary version including: eight positions with a probe location tag, dog, cat, sheep, horses, cows, pigs, camel, dolphins and other measure). expected date of confinement and fetus weight, etc. Image polarity: left and right flip, up and down flip. 7.5 MHz/L40 (40 mm wide) / 80 array element array, matching.